1. Blocked Views. Shrubs that have grown above your window tend to decrease natural light inside the home, and detract from the structure and appeal of the exterior. This example shows how even nicely maintained bushes can hide the character of a hope and block natural light from entering. 2. Foundation Killers. Some bushes consume all the moisture needed to keep the soil around your home stable. This adversely affects your foundation. Inspectors say Red Tip Photinias are the worst offenders in the shrub category. They thrive best in loamy soil, not the clay that is common in Wynnewood North. Avoid planting them near your foundation and in shady areas. Pro & Cons for Photinias in Texas. 3. Spacing. 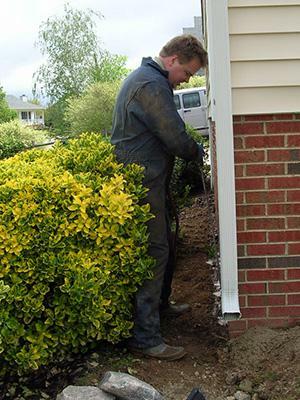 Shrubs should be planted far enough from the foundation to allow an adult to walk behind them with ease. This allows for routine inspection of foundations and walls. Bushes too close raise red flags. This example shows the minimum amount of space needed for maintenance teams to access your beds, windows, and exterior walls; inspectors to review your foundation; and pest control to adequately treat your home for termites and other pests. Make sure to review the full width and height when purchasing shrubs to prevent overgrowth. 4. Linear Planting. Although a favorite of developers during post war construction, this planting style is now passé. Used curved and varied beds. It's incorrect to think that landscape designers believed the linear model of planting (a single row at the front of house) was appropriate during the mid-century. Developers planted what was cheapest and easiest. Fifty years later, the result is often a stringy hedge that hides the character of the home. 5. Disparate Species. As bushes in the hedge die off, vacant spaces, stringy stragglers, and disparate varieties remain. These hedges tell perspective home owners that you haven't been vigilant in maintaining both the interior and exterior of your home. If your shrubbery needs an update, do it today so that you can enjoy it before you need to sell.